This region of Argentina nestled in the Andes cordillera, has special sights to offer. In fact, for Barbara our guest blogger, Northern Argentina is one of the most spectacular parts of this South American country. The landscape reminded her of Arizona and the Grand Canyon. 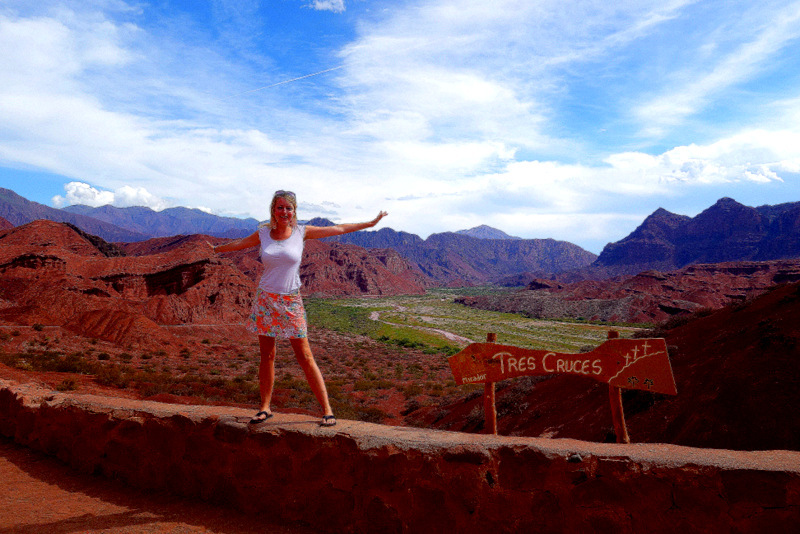 Barbara gives us her 4 favourite places to visit in Northern Argentina. Salta is the center of Northern Argentina. It is a fairly large town with some beautiful churches. It is called Salta La Linda (Salta The Beautiful). The main square, Plaza de las Armas is a center of most action. A hotel room overlooking the main square is a real treat. I loved the view of all the tall palm trees and the dense vegetation of the square from my balcony every morning. We hiked up to the top of the mountain to see Salta from above. It is a pilgrimage visited by many people from all over the World. There is also a cable car for those who don’t want to walk. Salta has a vibrant nightlife on Calle Balcarce. The street is full of restaurants, pubs and night clubs and local penas, where the gauchos play local folklore music. Salta is a good hub to get around to explore the indigenous villages around it. You have good transportation options from here and it’s a good place to start your discovery in the neighbouring mountains and the desert. It took about five hours to reach Tilcara by bus from Salta. It was a lovely town in the mountains north of Salta. It was overly touristy and a bit expensive. Many indigenous people lived in this town and they played folklore music in penas (local pubs). Pena Carlitos is a great place to have dinner, where one can try the local specialities, such as tamales and humitas. They are made of corn stuffed with meat or sheep cheese. The food was delicious. The entertainment was provided by the owner of the restaurant. Carlos was singing folklore songs. The music was great. In the morning, we explored the mountains of Tilcara, the cactus plantation, and the llamas. These fury creators were everywhere in Northern Argentina. The mountains were colorful. The cacti were huge. After Tilcara, we continued our journey to Purmamarca to see the Mountains of Seven Colors. Purmamarca was built around the Mountains of Seven Colors. The mountains were colourful, they had all the shades of white, pink and red. It was just like being in Arizona. On the main square of Purmamarca there was a large market, where you could buy beautiful souvenirs and handicrafts of the locals. Trekking around Purmamarca to see the colorful mountains is one of the best experiences of Northern Argentina. About five hours drive away from Salta, you can find a spectacular town, Cafayate. You can see some of the most picturesque mountains along the road. The place reminded me of Arizona. The colors and the mountains were very similar to the canyons and the desert of Arizona. Although, the mountains are smaller and more colorful in Argentina. We stopped at many different places to take photos, we saw an amphitheatre and a few other spectacular spots. We saw a large rock frog. From Cafayate we continued onto see Quilmes on the Route 40 to see the ruins that was left behind by the Quilmes people. It was a town of 5000 people around 850AD. The ruines in Quilmes were spread out on a large territory. We saw a cute llama. He posed for a photo for us. Then we hiked for a while and took spectacular photos on top of the mountain. The next morning we drove back to Salta on the most picturesque road you can imagine and stayed there for another night before heading over to the Atacama Desert in Chile. 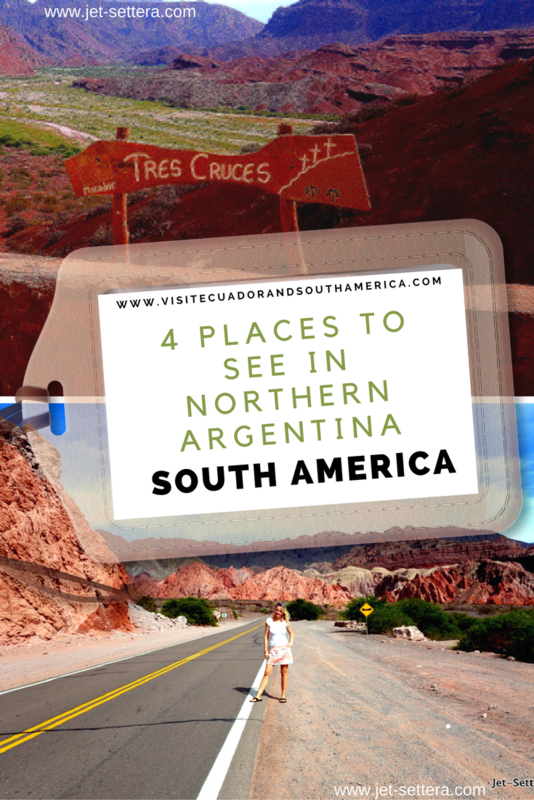 On the whole, this article gives you a good idea over these 4 places you can visit in Northern Argentina. Consider adding them to your itinerarly, depending on the time you have in this big South American country. If you need additional and in-depth information from a reliable, well-written travel guide that you can carry around without the need of wireless internet regarding main attractions to visit, tips, maps and more in this amazing South American country.